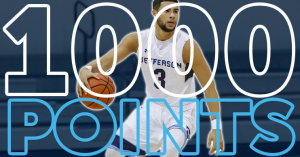 Kylan Guerra reached 1,000 career points in the win over Wilmington. 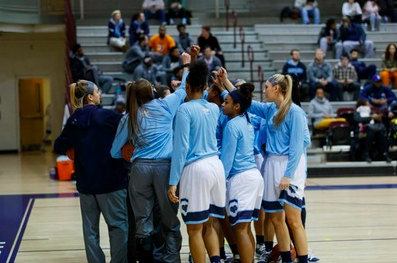 Both the men’s and women’s basketball teams continued their stellar seasons, sweeping a doubleheader over Wilmington (Del.) at the Gallagher Center on Wednesday. 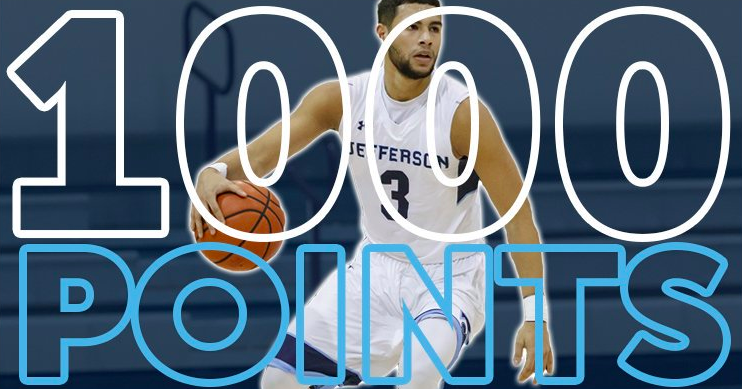 Junior Kylan Guerra became the 56th player in Rams’ history to reach 1,000 career points as Jefferson (14-6, 9-2 CACC) downed the Wildcats 97-94 in an overtime thriller for the squad’s ninth-straight win. Head coach Herb Magee said his team’s prep and execution in close contests have helped to pave the way for the Rams’ longest win streak since 2014. A key player this season, Guerra understands the game well, Magee noted. As a prime example, the business management student leads the CACC in assist-to-turnover ratio and assists, averaging 5.8 a game. Assistant coach Stephanie Carideo said Guerra is one of the first players in the gym to get in extra shots before practice and one of the last people to leave. The Rams have reached 20 straight wins to start a season for only the second time in program history. A humble Guerra admits he felt a bit relieved to hit the milestone and said he’d rather set his sights on team goals versus the next personal accomplishment. On the women’s side, the Rams’ (20-0, 11-0 CACC) remarkable run continued, as they coasted 77-56 over visiting Wilmington. They have reached 20 straight wins to start a season for only the second time in program history, following the 1992-93 team that began 22-0. They’re ranked No. 2 in the latest D2SIDA Media Poll, their highest ranking ever, and fourth in the WBCA Coaches Poll. Women’s head coach Tom Shirley, who picked up his 768th career win, attributes his team’s success to a veteran group of versatile players, who all can play tough defense and score. For instance, senior Jessica Kaminski recorded a game-high 18 points against Wilmington, her 13th straight contest in double figures. The psychology student now stands at No. 12 on Jefferson’s all-time scoring list with 1,301 points. “This team is coming off a 26-6 season, and they realized at the end of last season they could be special this year,” he said. Read more about the men’s win here and the women’s victory here. Both teams visit USciences on Tuesday, Feb. 5, and return home on Saturday, Feb. 9, for Senior Day/Alumni Day against Dominican (N.Y.).